The president told reporters he fully supported his Supreme Court nominee and said he has no backup plan to replace him. WHEELING, West Virginia — President Donald Trump on Saturday fully backed his Supreme Court nominee, Brett Kavanaugh, said the FBI investigation of him may be a blessing in disguise and questioned whether Sen. Dianne Feinstein might have leaked the sexual attack allegation from Christine Blasey Ford. The president spoke for the first time about his embattled nominee since ordering the additional FBI background check amid sexual misconduct allegations against the judge. Trump made the comments to reporters as he was departing for a reelection rally in West Virginia later Saturday night and he brought up Kavanaugh at the campaign event. At the raucous Saturday night rally, Trump offered up Feinstein as a possible leak and the crowd booed. The president went on to mock her response at the Senate Judiciary Committee hearing on Thursday when she was asked if she or her staff leaked Ford's allegation against Kavanaugh. She denied that she had. 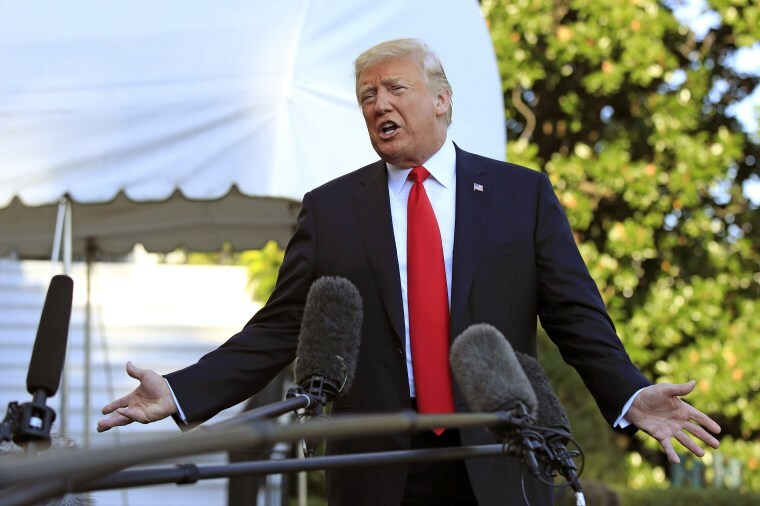 Trump trashed Democrats and the media at the campaign event, saying the Kavanaugh hearing at which both the nominee and Ford testified showed that the Democrats were full of "anger" and "mean," "nasty" and "untruthful." The president said they were on a "mission to resist, obstruct and destroy. You've seen that over the last four days." "They don't care who they hurt, who they have to run over in order to get power and control," he continued. "That's what they want — power and control — we're not going to give it to them." He called the Democratic Party the "party of crime" and pointed out to the crowd that was a new line of attack on his part. At another point during the rally, which lasted over 80 minutes and touched on dozens of domestic and foreign issues, Trump said he and North Korean leader Kim Jong-un "fell in love." The president also launched into a scathing attack against the press, calling it the "enemy of the people," as he has before and drawing cheers from the crowd. Trump supporter Carolyn Kyanko, a retired educator, said the president's doubling down on Kavanaugh was all the more reason to get out and vote in November. "Do I believe Ford was sexually assaulted? I do. Do I believe it was Kavanaugh who did it? Absolutely not," Kyanko said. "Trump's commitment to Kavanaugh is just evidence of his loyalty. He's a loyal man." Earlier, Trump was asked by reporters about Kavanaugh when he was on his way to West Virginia. "I think it's going very well," Trump said. "The FBI as you know is all over talking to everybody...he's a very high-quality person. I would expect it's going to turn out very well for the judge, there's never been anybody that's been looked at like Judge Kavanaugh." Trump added that "having the FBI go out and do a thorough investigation, whether it's three days or seven days, I think it's going to be less than a week, but having them do a thorough investigation, I actually think will be a blessing in disguise, it'll be a good thing." Trump suggested the FBI probe might even reveal who he said leaked an allegation of sexual assault against Kavanaugh by Ford and he hinted that it could be Feinstein. "I think, frankly, the FBI has a chance reveal a lot of different things," Trump said. "I'd like to find out who leaked the papers. Was it Sen. Feinstein? Because certainly her body language was not exactly very good when they asked her that question, so I would like to find out, as part of it, who leaked the papers, which Democrats leaked the papers?" There's no evidence Feinstein leaked the allegation and she has said she did not. Her office did not immediately respond to a request for comment Saturday night. Feinstein, the ranking Democrat on the Senate Judiciary Committee, has been repeatedly criticized by Republicans for being aware of Ford's allegation for six weeks and not bringing it before the committee. Feinstein has said she didn't take it to her colleagues because of Ford's request for confidentiality. The allegation became public when it was reported by The Washington Post. Republicans, including Sen. Chuck Grassley, R-Iowa, the chairman of the Judiciary Committee, have said the panel has procedures in place to handle confidential material and that it does so frequently. They have accused Feinstein of keeping the allegation quiet in order to stage an 11th-hour attack on Kavanaugh just before his confirmation vote. Trump said he has no plans to replace his Supreme Court pick. "I don't need a backup plan," the president said. "We have to see what happens. I think he's going to be fine. Again, one of the most respected men, and certainly one of the most respected jurists, or judges, in the United States." Trump said on Saturday that the FBI has "free reign" in its investigation, although NBC News reported exclusively that significant restraints have been put on the agency.